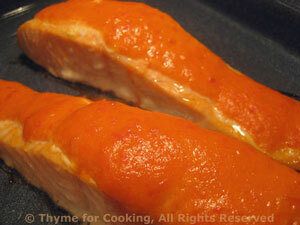 Baked Salmon with Red Pepper Sauce, Thyme for Cooking easy gourmet dinner. We don't often have risotto as a side side. 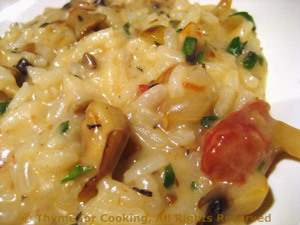 This is more of a traditional risotto (served as a separate course in Italy) with the condimenti being used to flavor it, rather than turn it into a meal. The recipe makes less than our usual amount. Any leftover sauce can go into the meatballs. I used fresh cepes and oyster mushrooms for this. Use the best / most interesting you can find. In medium sauce pan heat butter; add the onion and sauté until transparent. Add rice and sauté, stirring, for 2 - 3 minutes until rice has white center. When stock is almost absorbed add another 1/4 cup and continue adding 1/4 cup at a time and stirring. Before adding the last 1/4 cup taste a few kernels of rice. They should be just 'al dente' - slightly resistant to the tooth, but fully cooked. If more stock is needed add it 1/8 cup at a time and waiting until almost completely absorbed. At this point risotto will be thick but not stiff - there will still be visible liquid and it will not hold it's shape on a plate. Add the Parmesan and the condimenti, stir well. Spoon into a bowl or risotto platter and serve. Brush mushrooms, trim and slice. Heat oil in medium skillet. Add onion, mushrooms and sauté until starting to brown. Add tomato and simmer until it softens. Cover, turn heat to low and keep warm until needed. Just before adding to risotto, stir in yogurt. Note: It will continue to absorb liquid and the leftovers (if any) will be quite stiff. The risottos that we have eaten in northern Italy have all been served in soup plates (flattish bowls) and eaten with a spoon - not a fork. 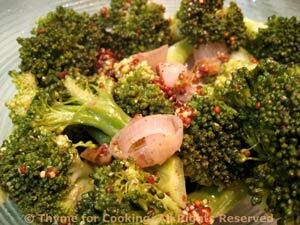 The broccoli is steamed, just until done, but should retain a bit of crispness. It's finished with a pungent mustard and shallot sauce. Put in a steamer basket in a saucepan with an inch of water in the bottom. Put on medium heat and steam for 10 - 12 minutes or just until done. Remove broccoli and keep warm. In same pan heat the oil. Add shallots and sauté until tender, about 3 minutes. Add mustard and stock, stir well. Add broccoli, toss to coat and heat through. Serve.